Tuscany! Land of grape and vine! You are a vineyard owner tasked with improving your winery. Construct new buildings, attract influential visitors, and build your prestige through growing, crushing, and bottling delicious grapes. But watch out! While Tuscany is a beautiful place to live, it is a competitive place to work. Can your vineyard outshine all others? Find out in Viticulture! 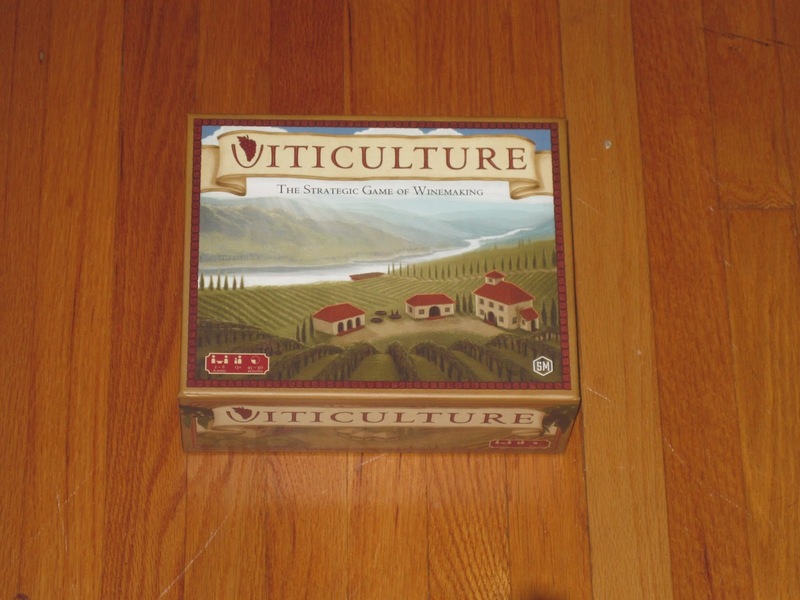 Viticulture is a worker placement game for two to six players. 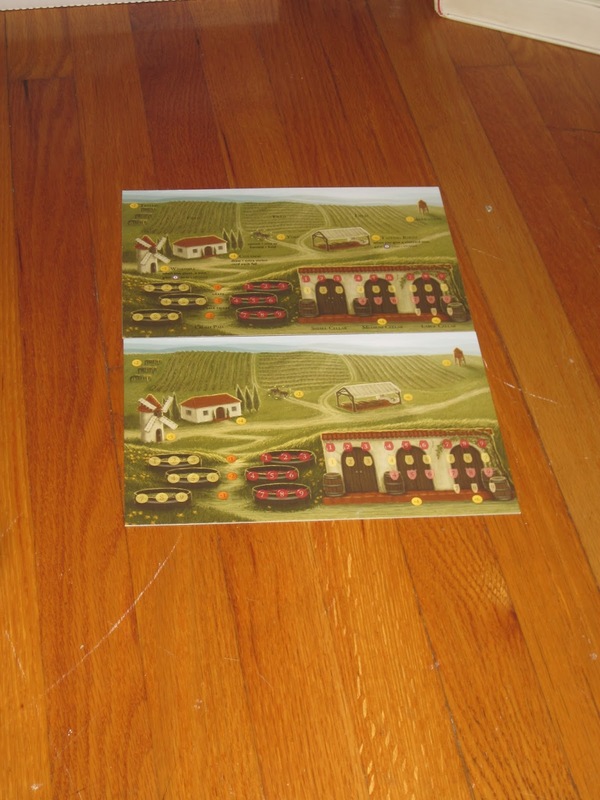 Players are vineyard owners in Tuscany and compete to earn victory points by making wine and filling wine orders. The player with the most points at the end of the game wins. When choosing a wake-up time, players balance the benefits offered versus the benefit of going first in each season. There is no benefit for going first, for example, and going last provides the benefit of using an extra worker for the year. Summer actions include things like drawing and planting vine cards, building structures (which increase player abilities at their vineyard), selling grapes and giving tours (both for lira), and playing summer visitor cards. Winter actions include things like drawing and filling wine order cards, harvesting fields, crushing grapes into wine, training new workers, and playing winter visitor cards. Each action area (both summer and winter) has limited spaces for players to choose, and the center space in each area includes a bonus for the player who chooses it. Unlike other worker placement games, however, a player must be able to fully utilize a space in order to claim it. The visitor cards, winter on top, summer on bottom. Visitor cards grant players one-time special abilities or extra actions, many times either boosting an action or providing a more efficient way to accomplish an action. They are central to the game. 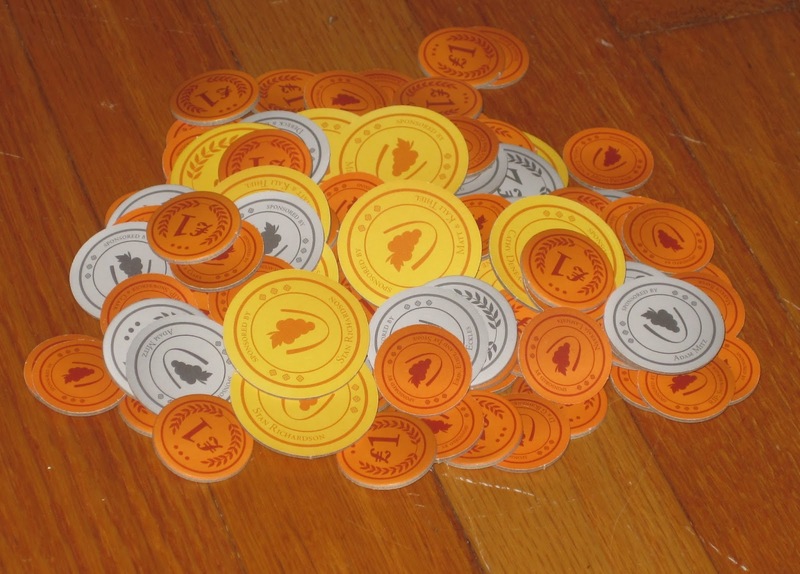 At the end of the year, grapes and wine age (increasing in value), players receive money for wine orders filled throughout the game, players discard down to seven cards, and the first-player marker rotates counter-clockwise. The game ends at the end of the year whenever one player reaches 20 points. Whoever has the most points is the winner. Wine Making or Whine Making? The worker placement genre is crowded and seems to get more crowded by the con. So how does the newcomer Viticulture stand up against the others? While Viticulture is probably not my favorite worker placement game (Agricola is hard to topple), I think it’s a worthy title, especially given its novel theme and production value. Viticulture is a beautiful game. When it’s on the table, it is stunning. The artwork is evocative, the pieces look great–everything about it gives it a fantastic table presence. But the components aren’t just beautiful, they’re also functional. 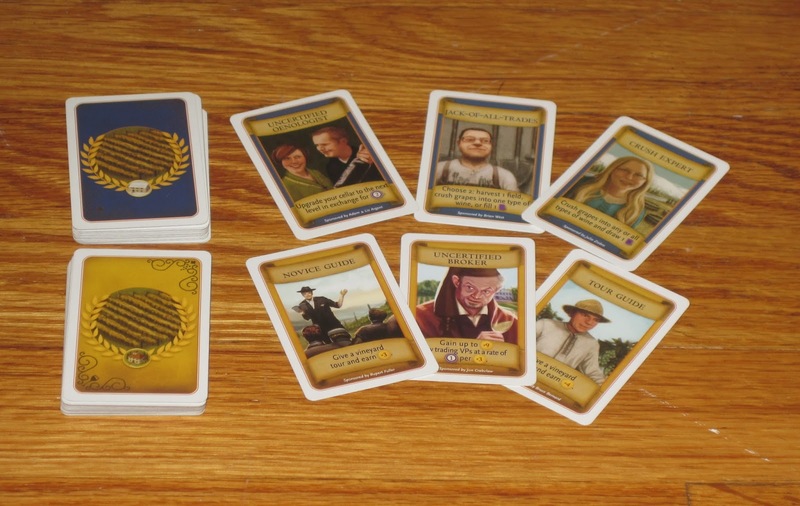 The central board and each player board are double-sided. One side is just the artwork with icons for reminders; the other side has text explaining what each space allows, along with a year order list. This is a great idea, and I wish other publishers would follow this model. I was playing in one game with a player who kept asking questions, and we found out his board was turned to the art-only side. Once we corrected him, there were no more questions about what buildings or spaces did. I find there are often questions when teaching a game; I love that Stonemaier Games has aided teaching as much as possible through the board design. The lira. Seriously, I am tempted to carry these around for every game I play. Better even than Poker chips. The components themselves, aside from their look, are very nice. The wood pieces feel a bit hollow, but I pretend they’re made of cork. There’s also nothing to complain about here, since each building that can be constructed has its own unique shape. The glass beads for grapes and wine are great, especially for keeping track of age. The central and player boards are on excellent stock, and I love the matte finish. The lira are perhaps the standout in the components. They look and feel so great that I’m tempted to transport them with other games to replace money or victory chits. 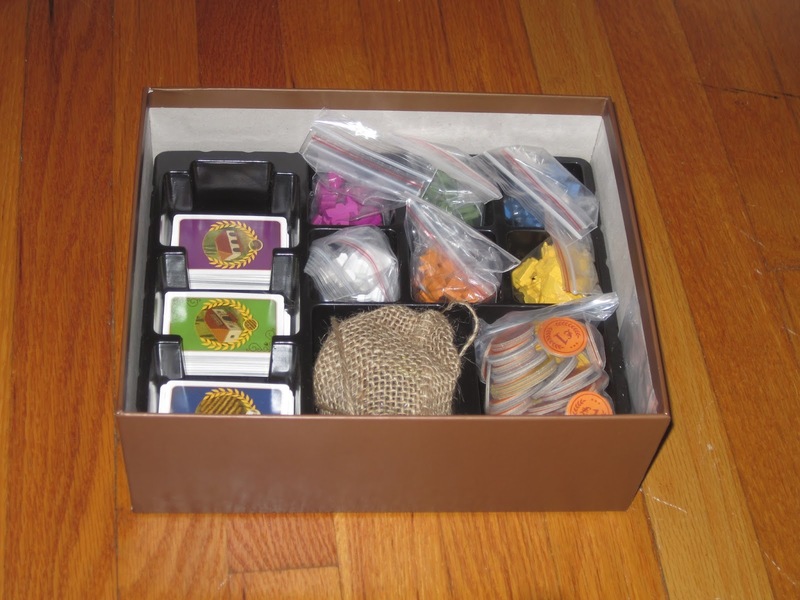 There are only a few things to quibble over in the components: the box size and shape and the cards. 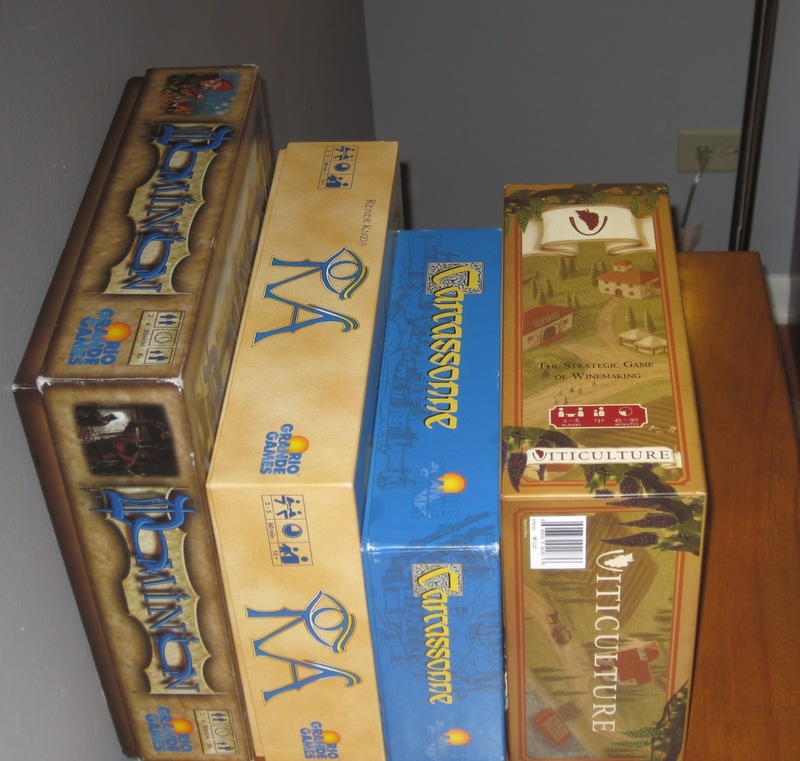 The box size fits the game well, but it’s nonstandard. Because of this it doesn’t really fit on my game shelf very well. The cards are the tiny Euro ones. Not my favorite, but the benefit is that they easily fit on the main board (less table space!). I’m not a huge fan of the cardstock, but this is my frequent gripe with this particular manufacturer, and I think I’m more sensitive to this than most others. You can safely ignore my curmudgeonly views on this once again. There’s a lot of stuff packed into this box. Speaking of the cards, they are the beating heart of Viticulture, especially the summer and winter visitors. After all, what good is a winery if people don’t visit? The summer and winter cards offer some variation on the actions available during those seasons, with some twists. Some give you access to actions at a discount. Some give you access to two actions for greater efficiency. Some give you more money, a greater benefit, or the opportunity for a fantastic benefit, but at a cost. If these abilities seem all over the board, they are. In fact, this is one of the criticisms leveled against Viticulture: the cards are too variable in abilities and too swingy for a game of this kind. My take on this is that yes, the cards are swingy, but dealing with this is part of the game. And when I teach the game, I am sure to warn players that the visitor cards are very important and can’t be neglected. (The same warning accompanies Stone Age, but no one seems to listen to me…) While there’s more luck in drawing cards in Viticulture, I don’t think it’s game-breaking luck. But players who are luck averse may not like this aspect of the game. Despite the luck of the cards, the game feels tight. Action spaces open up depending on the number of players, but the actions are always more scarce than you want them to be. Most of the time this is good since it rewards players for properly budgeting their workforce and keeps decisions tense, giving the game immediacy. However, toward the end, it can also make the game feel anticlimactic. 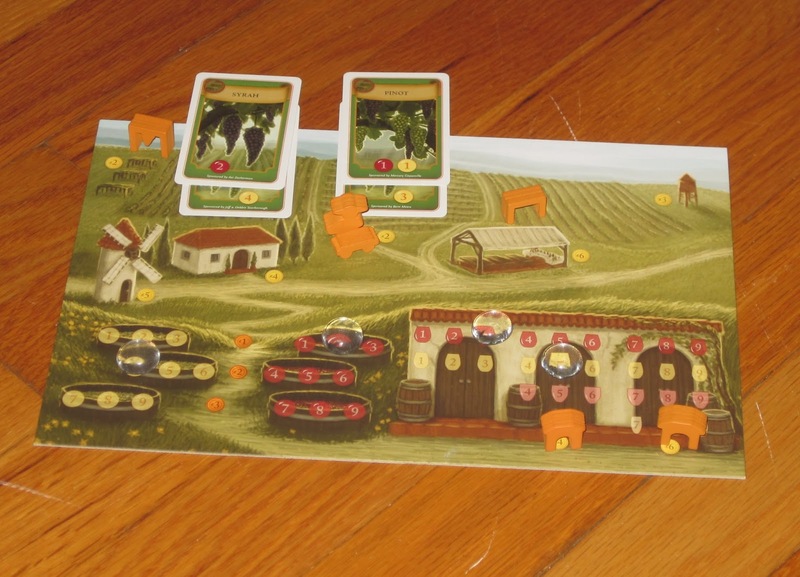 Viticulture is not a “multiple paths to victory” kind of game. Yes, you can score victory points doing lots of things, but the main way, the consistent way to score big is to make and sell wine (as it should be: you’re managing a Tuscan vineyard, for crying out loud). The only way to fill orders (outside of visitor cards that let you do so), though, is by claiming the “fill orders” space on the board, limited, again, based on the number of players. In each game I’ve played, the game has been tense until the final round, when one player fills their last order–and the other players can do nothing about it, either because the order spaces are filled or there are no more ways to score points and catch up. (It’s similar in this regard to Power Grid, another “racing” game that often ends in anticlimax.) Playing the game to the end of the year seems like crawling across the finish line. I know that this probably isn’t always how the game ends, but the scarcity in the last round and the limited action spaces has made for some sour endings to otherwise sweet games. The wake-up track is one of my favorite aspects of the game. Of course, the cards can be instructive here. The difference between an experienced player and a rookie player of Viticulture is timing. Rookie players want to play their best cards immediately. Veteran players know that a situation is coming when they will greatly need the assistance of their visitors, and they plan accordingly to maximize their efficiency. See? I told you those cards were important. All of the fill order spaces are blocked? There’s a visitor for that. Returning to the sweetness of Viticulture, one aspect I like is the game’s laid-back nature. Yes, I know, I just said that the game is tense (and it is), but let’s be realistic: no one dies if you play poorly (a reality you’d rather not face in Agricola or Stone Age), and you don’t have to feed anybody. Workers trained stay with you. You aren’t penalized for waking up early (aside from not receiving a bonus), you don’t go into debt, and generally the visitors are bearers of goodwill toward your vineyard. The game is tense, but the theme of the game helps bring players back to a place of calm. Perhaps my favorite aspect of Viticulture is its representation of time. Lots of games rely on timing–and so does Viticulture–but Viticulture also carefully depicts the flow of time. Each round represents one year, and each year is broken into four seasons. Only certain actions are available, depending on the season, and workers spent in the summer stay spent for the year–that is, each player must budget their workers wisely so as to last them the year. Vines are planted in the summer and harvested in the winter, and grapes and wine age from year to year. I love the way time naturally flows in this game and how players must plan to use time to their advantage. Player mats (and the central board) are double-sided to aid with teaching. Brilliant! In a similar vein, players choose turn order by assigning a wake-up time to their workers. The early bird gets the worm, but that’s about all the early bird gets. Late risers get the leftover actions, but they also get a bonus–sometimes a pretty hefty bonus. However, player order cannot be underestimated in Viticulture. The competition for the top spots on the board can be cutthroat, and so the extra edge of going first is a huge boon, especially when the bonus spaces are in play. I should mention that the wake-up track appeared in Fresco, another worker placement game, but I like its use much better here. In Fresco wake up was tied to worker morale and prices for paint, and these extra considerations complicated it for me in a way I didn’t like. In effect, players were choosing the best negative; in Viticulture the choice is between various good things, and I like this better. 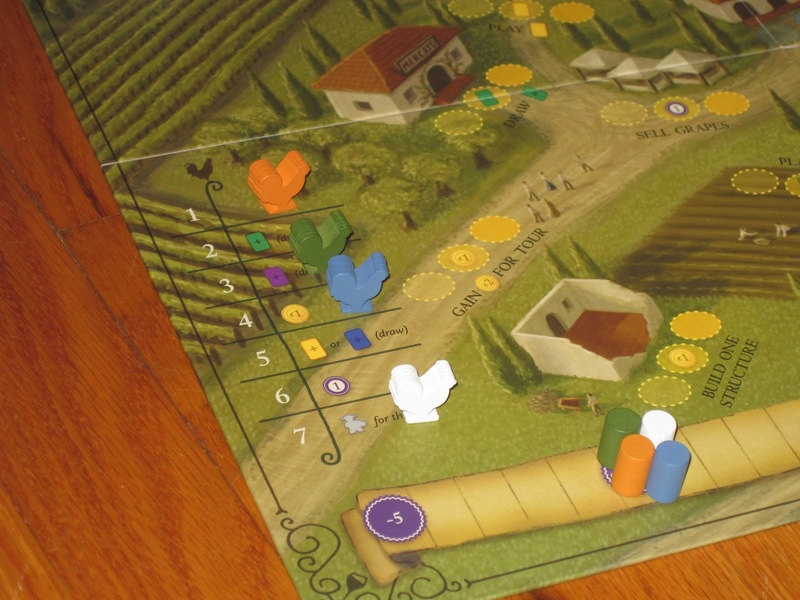 There is one thing in Viticulture that was a huge disappointment to me: the time it takes to play the game. The Stonemaier Games website advertises 60 minutes (and the box says 45-90 minutes), and I was quite excited when I saw this, as my most frequent gaming opportunities arrive in one-hour chunks. But even the two-player game lasted much longer than even the low estimate. While I think it’s conceivable to get the two-player game down to sixty minutes with time and practice, I can’t imagine playing with six, or four, or even three in less than ninety minutes. The board is manageable by being broken into seasons, so options won’t overwhelm new players, but each move still requires calculation, especially since workers must be budgeted for the full year. Familiarity will reduce player time, but there are still plenty of decisions to be weighed. Maybe I and all of my opponents are more deliberate players than most, but we all agreed that sixty minutes seemed more wishful than actual. This isn’t really a downside to the game so much as a disappointment. It fills its ninety minutes to two-hour game time well and doesn’t overstay its welcome. It’s meaty enough to merit the time spent. It’s just that I doubt even with experience you’ll be able to fit the game in an hour with more than two players. Also, a word on the two-player game. The game works okay with two players, though I don’t think this is the best player count. Part of the problem is the scarcity of spaces mentioned earlier: just one space for each action is available, so once taken, the other player is out of luck. This can make it hard to catch up (though I think the game is balanced well enough that this isn’t a huge concern). Catching up is easier with the bonus action space, which usually lets players accomplish more than the regular space, but the bonus space only opens up once three players are in. There’s a variant on the Stonemaier Games page that suggests using the grande worker from the Kickstarter expansion to allow players in the two-player game access to the bonus spaces. However, the grande worker is not included in the retail package, and so I was unable to test this out. All told, Viticulture is a very nice worker placement game, one of the better ones I’ve played. I’m not a wine aficionado, so the theme, while pleasant, didn’t do anything for me, but the gameplay was enough to keep me engrossed. A few of the aspects I mentioned above can be frustrating if you don’t plan for them; I think they work fine as another thing players must be prepared for. This game looks great, plays smoothly, and offers good tension without players being overwhelmed by penalties. There’s enough novel here to merit play, even if you have a lot of worker placement games, and enough familiar to allow experienced players to jump in quick. (I wouldn’t recommend this as a casual game.) 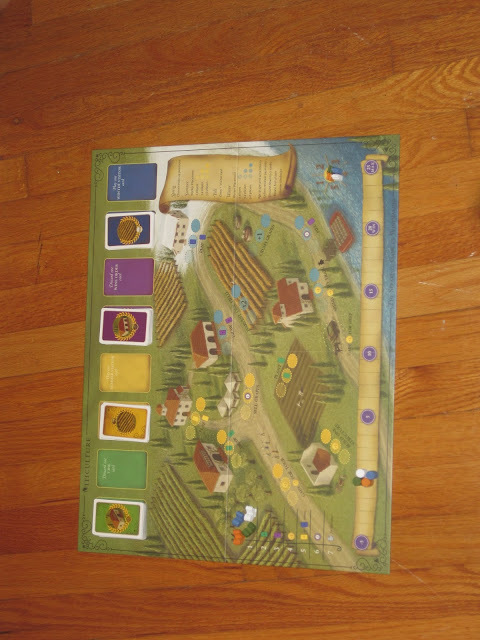 Viticulture is a good game, dripping with theme: I recommend that you drain your glass and request another. iSlaytheDragon would like to thank Stonemaier Games for providing us with a review copy of Viticulture. Thank you all so much for reviewing Viticulture! I really appreciate it. I completely agree with your criticism about the game being anticlimactic. Fortunately I’ve found that the grande worker almost completely fixes that issue, making the final year tense until the last worker is placed. The grande worker will be easily attainable when I run the Kickstarter for the expansion pack and second edition in 2014. That’s good to know. Each game I’ve played has had at least one inexperienced player, so maybe it will go down over time. I hope so, as I’d love more opportunities to play. Many of the qualms Lenny mentioned were my own, but it’s worth stating; after experiencing the quality of Viticulture, I am looking forward to trying out Euphoria, which has more thematic appeal to me and I have confidence that it will be a solid game as well. Another game that uses art vs instruction sides is Royal Palace, very fun. Check it out. Hey, thanks for letting me know! That game had slipped below my radar, but I saw it included in the Gen Con math trade and was curious about it. I’ll have to check it out. Thanks for sharing this information i like it! What a well-written and informative review! Thank you very much for a job well done! This has become one of my favorite worker placement games. My favorite aspect of it is the build up of the game. After it’s over, I can look at my little player board and really see that I accomplished something. Nice review, really nice flow. I wish mine were half as good. Well done , sir!